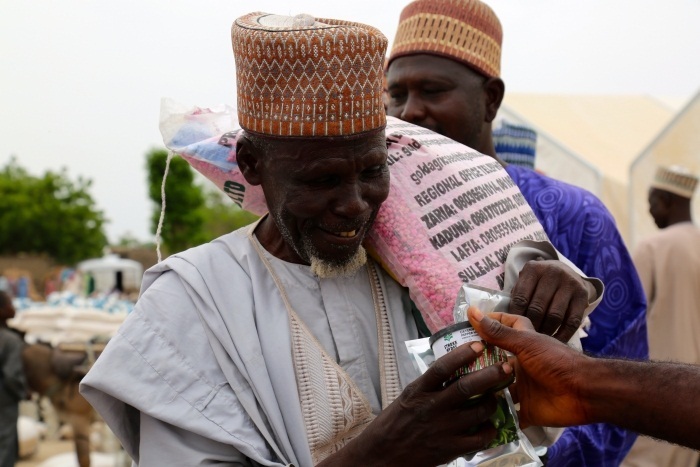 The United Nations Food and Agriculture Organization (FAO) and the World Food Programme (WFP) have launched a joint effort to support conflict-affected people in northeastern Nigeria to increase their food production and reduce dependence on food assistance. Using a ‘twin track’ approach, FAO is providing enough seed and fertilizer to produce up to eight months’ worth of food during the 2018 rainy season, while WFP covers the food needs of households until these crucial harvests in September. In Rann, in Borno state and close to the Cameroonian border, WFP is providing life-saving support to all 67,000 people living in the town. Meanwhile, FAO provided seeds and fertilizers to about a quarter of Rann’s households who have safe access to land and who, through a community-based assessment, proved capable of growing food. This includes families who have sought refuge in Rann as well as the host population. Fanna Kachella, from Rann, has eight children. She and her husband are keen to resume farming. Farmers in Rann and more than 30 other locations can plant maize, sorghum, millet and cowpeas following the distributions. In most places, they also received sesame, groundnuts, sweet pepper and watermelon seed for income generation. “Families in northeast Nigeria have been affected by conflict for nine years, and many have gone through terrible times. We need to work harder and together to put people back on the track of self-reliance, to rebuild their livelihoods and to restore their dignity. This joint assistance by FAO and WFP is a step in that direction,” said WFP Representative in Nigeria, Myrta Kaulard. During the rainy season spanning June to September, FAO will assist over 1 million people to become more food secure through farming. The Organization is mid-way into its distribution of disease and drought-tolerant varieties of crop seed and fertilizer using a kit system. In Kit 1, FAO is distributing maize, millet or sorghum alongside cowpea seed and fertilizer. Kits 2 and 3 are solely for women-headed households and contain vegetable and cash crop seed, respectively. The vegetable kit features okra and amaranth, a green leafy vegetable. Income-boosting groundnut and sesame, relished by women for their good market prices, round out kit 3. Every month, WFP is for its part providing food and cash assistance to around 1.2 million food insecure and vulnerable people. To prevent malnutrition, WFP is also distributing specialized food to around 200,000 young children and almost 150,000 pregnant or breastfeeding women. In its 2018 appeal for northeastern Nigeria, FAO requested USD 31.5 million to assist farmers recover from the impact of the conflict. About USD 13.2 million has been received, leaving a gap of USD 18.3 million. WFP urgently requires USD 49 million to continue lifesaving support until the end of 2018 to assist the most food insecure and vulnerable Nigerians.